Samyang Facebook Account Changes Name to "Next77 Global"
I received a Facebook notice this morning that one of the brands I was following – Samyang Optics – had changed its name to "Next77 Global." I'm not quite sure what's behind the name change, but I'll keep an eye out for any press releases on the matter. Permalink: Samyang Facebook Account Changes Name to "Next77 Global"
Just posted: Sigma 24-35mm f/2 DG HSM Art Lens Review. Kudos to Sigma for bringing us a groundbreaking f/2 full frame zoom lens! 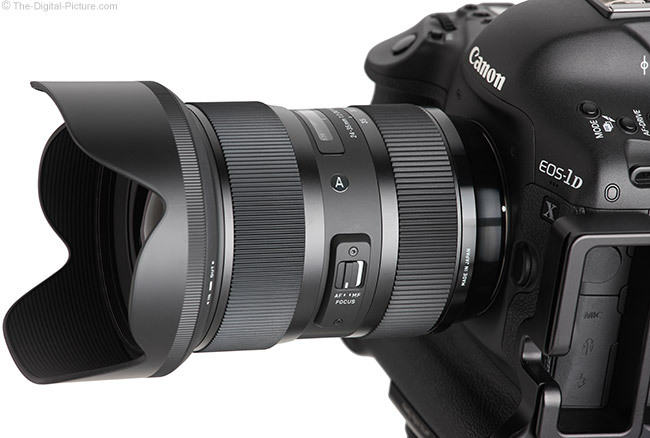 B&H has the Sigma 24-35mm f/2 DG HSM Art Lens in stock. Canon China has posted several full resolution sample images taken with the newly announced EF 35mm f/1.4L II USM. B&H has the EF 35mm f/1.4L II USM available for preorder. Amusements parks, carnivals, fairs, and similar are popular summer attractions. The next time you visit such attractions, be sure to take your camera gear (including a tripod) and ... make sure that you stay until the lights come on. To be more "attractive", amusement rides are typically well-lit at night and these rides (along with other signage) can make colorful images. The first step: before you leave home, make sure that you know the park's rules for photography. The bigger the park, carnival, etc., the more likely that your activity will fall under regulation. The Ferris wheel shown here was captured at Knoebels Amusement Resort in Elysburg, PA (America's largest free-admission park). This park requires permission for "Professional Photography". Also before you go, scope out potential opportunities using the park's map, satellite imagery and photos found online. Look for colorful rides that move significantly and have lots of lights on the moving portions of the ride. While motionless lights can be attractive in images (especially if out of focus), moving lights can be made to cover much more of the frame, replacing dark sky with bright light. Spinning rides often work well, but roller coasters often do not. A perfect night photography ride example is the big Ferris wheel at Knoebels. The park has recently installed a new LED lighting system that displays constantly changing colors as the big wheel spins. The ride looks impressive and attracts many spectators in addition to riders. Though it has excellent image quality, my choice to use the Canon EF 11-24mm f/4L Lens for this image was foremost for the ultra-wide focal lengths. Because of the many obstructions around (notably, trees), I wanted to be as close to the ride as possible and also wanted the close, looking-up perspective. This position also helped avoid people (the spectators I mentioned) in the frame (and the model release complication they could potentially add). There are many options for photographing amusement parks in the dark (or just before dark), but I like to fill a significant amount of the frame with light. In this particular case, I liked having the entire wheel in the frame while shooting (I was over 11 hours into my commercial shoot and had gone to bed at 3:00 AM that morning, so I can't argue that my decision making ability was not slightly clouded at the time). During post processing, I decided that I liked the wheel cropped tighter, showing even more color in the frame and making the support structure larger in the frame. That the 5Ds R has such extreme resolution enabled me to crop significantly into the frame and still have a high resolution image remaining (roughly 22 megapixels). And, I still have the full size image available if wanted at a later time. Camera exposure settings for lights moving in the dark are often determined by aperture and ISO. That was the case here. Since the lights in the middle of the wheel are not moving as fast as the outermost lights, there is an overall exposure balance required. The LED lights were very bright and ISO 100 with an f/11 aperture worked well in this case (I reduced the brightness somewhat in post processing). I adjusted the shutter speed (in manual mode) to capture the complete movement between wheel spokes without overlap (which would cause overexposure), generating a complete circle of light that, with the changing lights, resembles a pinwheel. Dark park photography will test your visualization ability, but it is great fun to anticipate and view the results. It is not hard to create attractive blurs of light at these venues. Give after-dark amusement park photography a go! It shouldn't be hard to entertain the kids while you do. Setting Expectations for the Canon EF 35mm f/1.4L II Lens – Did You See the MTF Chart? The Canon EF 35mm f/1.4L II USM Lens Review page is loaded with my expectations for this lens along with comparison charts and other information. Canon's MTF chart foretells exceptional optical performance. An MTF comparison between the version I and II lenses is included in the preview. 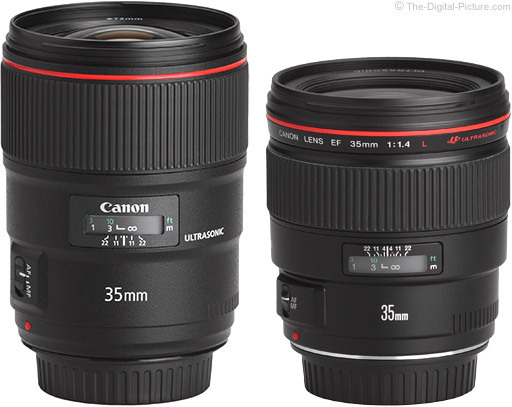 The image accompanying this post shows an approximate size comparison between the older Canon EF 35mm f/1.4L USM Lens (on the right) and the new 35 L II. Obviously, the new lens is modestly larger. 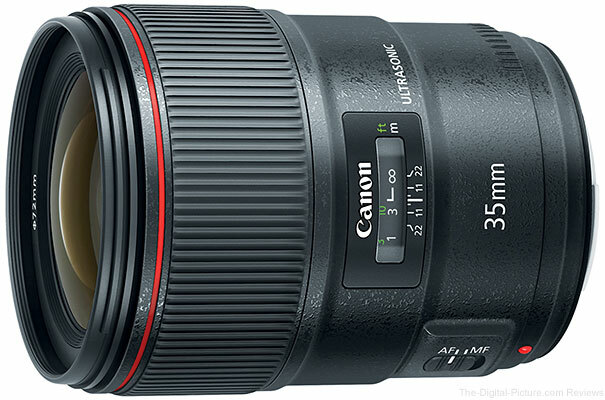 B&H has the Canon EF 35mm f/1.4L II Lens available for preorder. 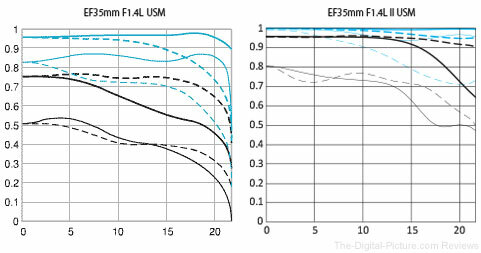 Permalink: Setting Expectations for the Canon EF 35mm f/1.4L II Lens – Did You See the MTF Chart? 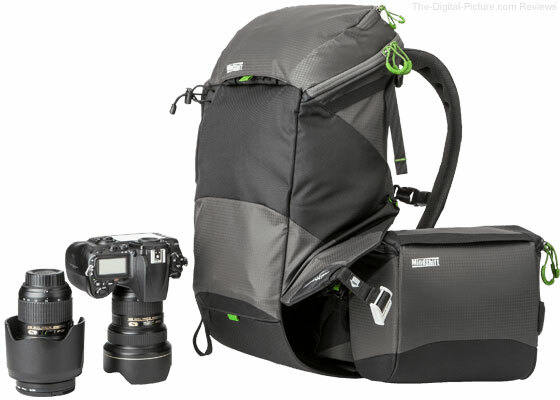 The Industrial Designers Society of America named our sister outdoor company MindShift Gear’s rotation180° Panorama Backpack a winner of the Silver IDEA Award. The rotation180° Panorama was selected from among more than 1,700 projects entered from around the globe in 20 categories. New IDSA Board of Directors Chair, John Barratt—a former IDEA Jury Chair—calls the competition “the authority on design” and says IDEA jurying is “the most rigorous and thoughtful” in the world. The rotation180° Panorama is the first rotating day hiker backpack. Designed for hikers who carry cameras, binoculars, GPS devices, nature identification books, maps, tablets, and more, the rotation180° Panorama’s beltpack rotates to the front for quick gear access without first having to take off the backpack, or even stop hiking. MindShift Gear backpacks are available from www.mindshiftgear.com and other leading outdoor and photography retailers. Today, we’re excited to announce that — in addition to square posts — you can now share photos and videos in both portrait and landscape orientation on Instagram. Once you share the photo, the full-sized version of it will appear to all of your followers in feed in a beautiful, natural way. 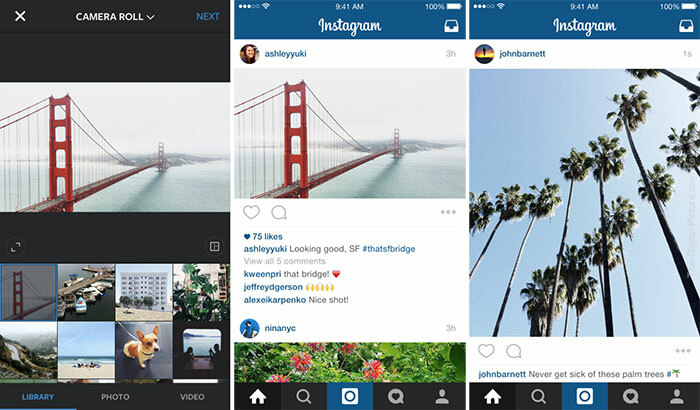 To keep the clean feel of your profile grid, your post will appear there as a center-cropped square. We’re especially excited about what this update means for video on Instagram, which in widescreen can be more cinematic than ever. While we’ve historically had separate filters for photos and for videos, all filters will now work on all types of moments. You can also adjust the intensity of filters on videos, too. We continue to be inspired by the creativity and diversity of the Instagram community, and we can’t wait to see what you create next. 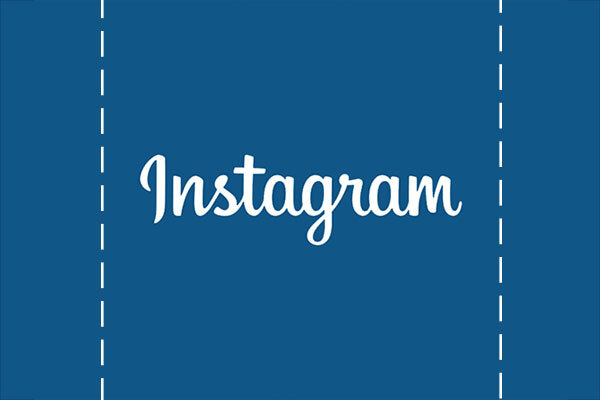 Instagram for iOS version 7.5 is available today in Apple's App Store, and Instagram for Android version 7.5 is available today on Google Play. Watch this sample video captured with the powerful and portable Canon EOS M3 interchangeable lens camera. B&H has the Canon EOS M3 available for preorder. Canon Professional Services will be on site at the Tennis Center providing support for photographers covering the 2015 US Open. All photographers must hold valid credentials issued by the event’s organizers in order to gain entry. Our Canon factory service technicians will provide complimentary Clean & Check service on Canon EOS DSLR cameras and Canon EF/EF-S lenses. Clean & Check service is limited to (2) items per photographer and is provided on a first-come, first-served basis. Same day service is not guaranteed. Daily equipment evaluation loans will be available on a first-come, first-served basis. Pro Market representatives will be available to answer technical questions and offer product demonstrations. The Canon CPS support area will be located in the Photographers Lounge of the East Media section within the main Media Center situated in the southwest corner of Arthur Ashe Stadium. Monday, August 31th through Friday, September 11th from 9:00am to 5:00pm. Schedule during the Semi-finals on Saturday, September 12th and Sunday, September 13th to be determined and will be posted on site. By the way, you might want to check out the MTF chart for the new 35L II – it's impressive! Below you can see the 35L on the left and the 35L II on the right. 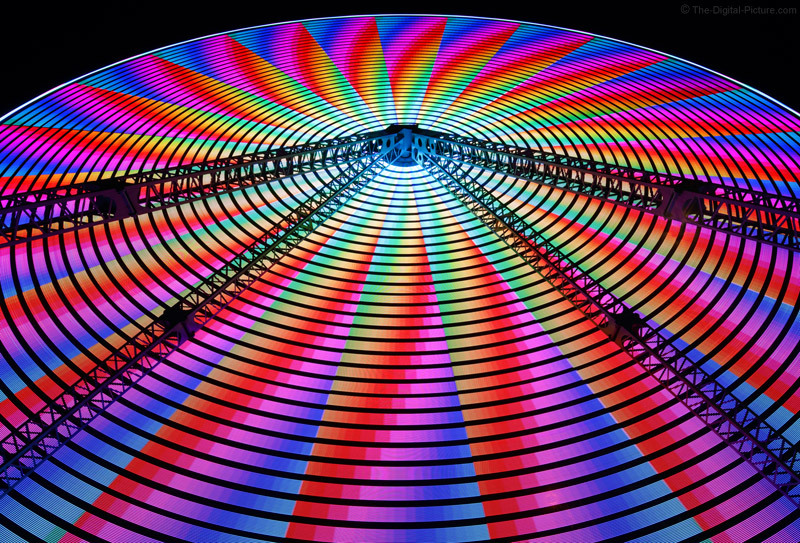 The new Canon-developed BR optical element offers characteristics that significantly refract blue light, which lies within the short-wavelength range, to achieve impressive levels of chromatic aberration correction for outstanding imaging performance. The BR optical element, positioned between two glass lens elements to create a BR lens, will make its debut in the new EF 35mm f/1.4L II USM wide-angle fixed-focal-length lens, which is scheduled to go on sale in October 2015. Canon develops optical elements by reviewing organic optical materials, beginning with the design of molecular structures, with the aim of achieving optimal chromatic aberration correction that suppresses color fringing. 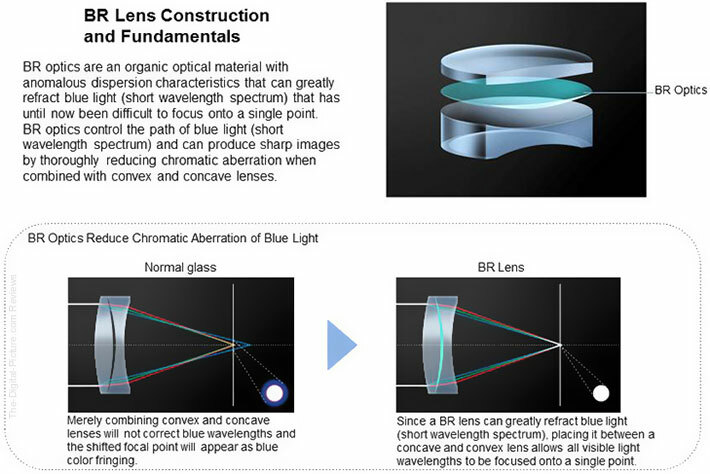 With the successful development of the BR optical element, which offers unique light-dispersion characteristics that significantly refract blue light—a wavelength that, until now, had proven particularly difficult to converge to a specific focal point—Canon is able to develop lenses that result in outstanding imaging performance by correcting chromatic aberrations at an exceptionally high level. B&H has the Canon EF 35mm f/1.4L II USM available for preorder. 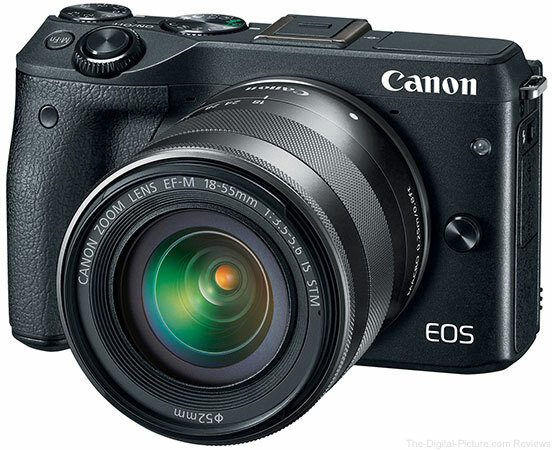 MELVILLE, N.Y., August 27, 2015 - Canon U.S.A. Inc., a leader in digital imaging solutions, today announced the EOS M3, a compact and stylish interchangeable lens digital camera created for enthusiast photographers who demand premium performance. Fusing Canon’s outstanding image quality and DSLR-levels of control in a small and lightweight camera body, the EOS M3 camera offers the ability to capture important moments in outstanding detail. Built-in Wi-Fi and NFC for streamlined photo sharing and wireless remote control. The EOS M3 camera offers photographers the flexibility to unleash their creativity through its compatibility with Canon EF-M lenses as well as a wide variety of Canon EF and EF-S lenses when used with the optional Mount Adapter EF-EOS M. Other compatible Canon accessories include EX-series Speedlite flash units, Speedlite Transmitter ST-E3-RT, and Electronic Viewfinder EVF-DC1. Users will also have the ability to remotely capture and share images with Canon’s Camera Connect smartphone application**, using the EOS M3’s integrated Wi-Fi and NFC connectivity. Time after time, I am in position to photograph the sunset with many other photographers and observers around me. It is (usually) lots of fun talking to those nearby, but ... as soon as the sun goes behind the horizon, most people pack up and leave. Last week, the same thing was happening as I was bayside in Seaside Park, NJ. Right after the sun disappeared, a friendly photographer came over and asked if I got "it" while showing me his favorite pic of the setting sun. I replied that I did, but indicated that the main show was likely still to come. He said that he liked to see the sun's reflection best. My thought was that his preference is fine, that we are all different, that I too like the sun's reflection and that I was still expecting the best yet to come. Fortunately, this gentleman had enough question about my opinion vs. his that he stuck around. Fifteen minutes was all that was needed. 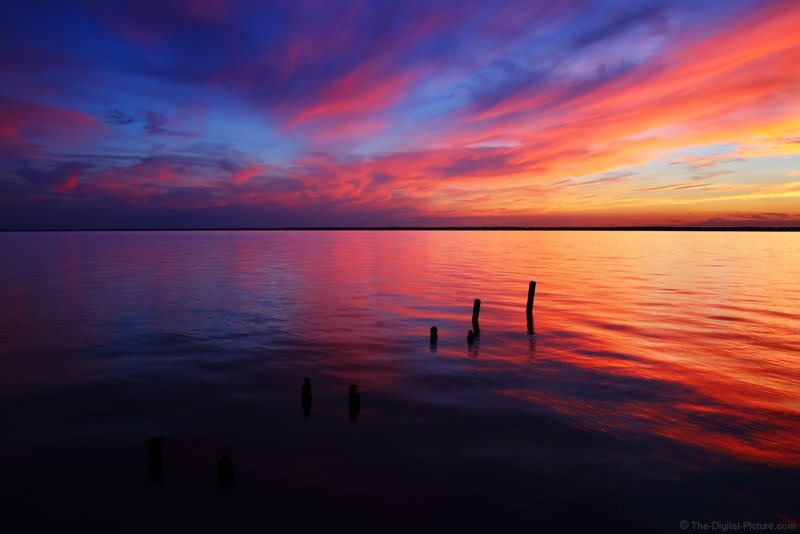 The color in the sky was very impressive on this evening and Barnegat Bay was very calm. About 25 minutes after the sun set, the other photographer returned very excited. Upon a quick review of his website the next day, I found only one picture from that evening. One captured well after the sun had set. Unless I am shooting landscape that the setting sun is directly lighting, I am usually more found of my post-sunset images. This image was my favorite from the night (though I have many close runners-up). This is an HDR image, comprised of three exposures used to balance the overall brightness of the final image. While an f/2 max aperture lens invites many uses in addition to landscape photography, the focal length range of the Sigma 24-35mm f/2 DG HSM Art Lens is great for this use. Since the Sigma 24-35mm f/2 Art Lens was what I was evaluating at the time, I put it to use for my sunset session. It performed excellently.